Do you have an old smartphone lying around and want to find a creative way to reuse it? 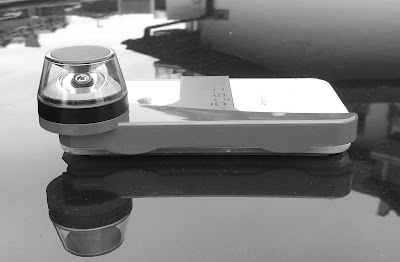 Let's make a Do-It-Yourself 360° Street View camera and record your own hyperlapse videos! Car - to put your camera on. Stick the Kogeto Dot lens onto a rear camera. If you don't have an iPhone 4s, cut the plastic bindings and glue the bare lens to your smartphone so that the ring is fully visible through the camera. Clip the magnetic sheet to your smartphone's dimensions and glue it to the bottom of a smartphone cover. Cut a window on top of it for the Dot lens. Start a time-lapse app on your fully-charged smartphone, put it into the case and stick on a clean roof of your car. Now it's time to have a ride! Warning: in order not to loose your new Street View camera, do not drive fast or protect it with a duct tape! Unwrap circular 360° images using e.g. the free 0-360 UnWrapper, optionally adjusting the contrast, saturation and sharpness of JPG images. What it does: create a 24 FPS MP4 video from a series of images starting with IMG_0001.JPG, upscale by 2x and letterbox by 2x. Inject 360° metadata to the output MP4 file using Spatial Media Metadata Injector and selecting My video is spherical (360). Upload the 360° video to YouTube, Vimeo or Facebook. Have a look at the demo videos below. You can pan the viewport during play using your mouse or W/A/S/D keys. The quality is not the best, but it could be improved using a smartphone with a better resolution camera or the Fishball.